The last few weeks have been busy and stressful. The kids got their results from their exams and everyone did well. Nora, who had worried herself silly thinking for sure she was going to get at least one 'cak', turned out to get an excellent result on her report card - Mumtaz! She was angry that she wasn't the best in the class. Now the kids are back into the routine of school and working toward the final exams which seem to be just around the corner. I've been rearranging and sorting through things both at work and at home. Throwing out what isn't useful is something I try to do as often as possible. It's amazing how things seem to accumulate! Digging through things always seems to drag back old memories too, not always good ones, but it's a necessary part of one's life. I bought two new cupboards for work and now I can move more of the work related things out of my house and into the cupboards at work. This would make more space for me at home to collect more home related stuff. De-cluttering is just rearranging your junk....sigh. Aside from work and home I've been sorting out friends too. I had a very good friend who really let me down, in more ways than one. 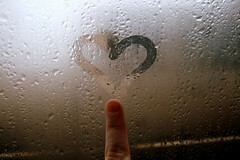 I tried my best to forgive this person but in the culmination of events I found it was best just to end the friendship. It had just gotten to be too much and one event, that will remain unmentioned, broke the camel's back. Friends are not always forever, I have discovered. Sometimes it's best to part ways and move on in life. It's been stressful but at the same time I think I've become a stronger person somehow. 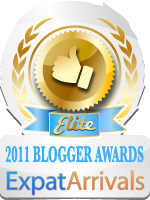 And now to tell you about other friends... blogging friends! Akram of Flying Birds and Hamed of Libyano paid me a visit yesterday. I've met Akram before but this was the first time to meet Hamed. Libyano looks just like his picture and Akram was wearing a hat (he's recently shaved his head). Unfortunately we could only chat a few minutes. It's really nice to meet other Libyan bloggers. Recently Hamed made a post on his blog about how important it was for everyone to donate blood. I suggested he arrange a blood drive for the Libyan bloggers. It would be a good way for us all to meet and do a good deed at the same time. What do you think? Yesterday at school my students and I read and discussed a recent article from the New York Times about the 'online disinhibition effect', otherwise known as 'flaming'. The article covered two topics; losing your inhibitions while in the anonymous virtual world of the net and sending emails and messages that are misinterpreted by their recipient because of the lack of visual clues that are present in face to face communications. We talked about what could be done to solve the problem of misinterpreted messages; the article mentioned video e-mails. But we thought about adding another button on the menu... the REGRET button. How often have you clicked on SEND and only moments later regretted it? The REGRET button would solve this. Just click on it and if your message was still unopened by the receiver it would be magically removed, but if it had already been opened an automatic response would be sent containing a polite message that would ask that the receiver disregard the previous message. Hmmm... it might work! Jenna asked me last week to make her an appointment to have her hair cut. 'Mom, I want it cut to here.' she said, pointing to the top of her ear. I let her beg for a few days just in case she changed her mind. She was insistent so I finally picked up the phone an made her a date with Sheila. On the way we stopped by the bakery and picked up a tray of freshly baked pastries. That's me, multitasking as usual, combining haircutting and breakfast. Here's Jenna with her long locks.... the before picture. It's short! Really short! Just what Jenna wanted. Afterwards we decided to do a little shopping. What could be a better way to spend your morning? It was still early and the shops were just opening up. We were the only ones in a clothes shop when all of a sudden three women came into the shop. They were talking a mile a minute, all hustle and bustle. They came directly over to where Jenna and I were standing and started pushing and shoving to look at what I was looking at. Now, I know for a fact that as a rule Libyans like to touch one another. They shake hands and kiss when they meet, but in public, with strangers, they avoid touching as much as possible. I said to Jenna 'These women are not OK.' and I stepped back, immediately looking down at my purse. Of course the zipper was open and my wallet was gone. I recovered my wallet and checked to make sure nothing else was missing. As soon as I saw that everything was there the women made a run for it. Out the store they went. The shopkeeper was more upset than me I think. Call it sixth sense or whatever, I knew from the moment those women walked into the shop they were up to something. All this excitement, and all before 11 in the morning! What's the rest of the day going to bring? I ran out today looking for the perfect basket or bag to take to the bakery. The bakeries have stopped giving out plastic bags for the bread; a new campaign to save the environment. I think it's great, like in the old days when I had a stack of flour bags that were used to carry home the bread. But these days I don't have any flour bags so Jenna and I drove around looking in the shops for a bag or basket to serve the purpose. I didn't see anything I liked. A few weeks ago there were lots of baskets and bread bags in the shops - collecting dust! I guess everyone has the same idea as me and they've all run out to buy bread baskets and bags. I'll have to look some more - in the meantime I'll have to use the brown paper sacks that the bakeries provide. I'm not sure which is worse - a plastic bag that isn't environmentally friendly because they take forever to disintegrate, or a paper bag made from trees. Maybe the paper is recycled. I still prefer a basket, I'll have to keep looking for the perfect one. I know that there are some fantastic baskets along the roadside in Tunisia... maybe I can convince Mustafa that I need to go get one... hmm.. now that's an idea! There are some nice pictures of Libya in the TrekEarth gallery. It's a nice collection with pictures from many different cities and places. Last year my sister had a jacuzzi installed in my mother's upstairs bathroom. I think they were needing some renovations and just decided to go deluxe. 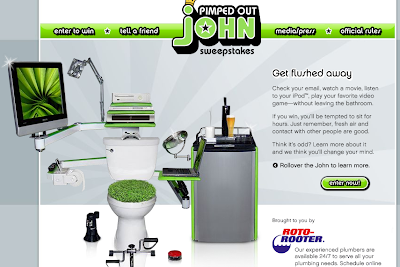 Today I saw this sweepstakes for the 'Pimped Out John' and decided to enter it. This would be perfect for my mother! It will go great with the jacuzzi too! So Mom, if the Roto-Rooter people call you up and say you've won the Pimped Out John don't hang up on them... it's for real! Now I've gotta see if there's a contest for 'Pimp my ride'.... my soccer mom car needs some serious help! Recently the kids had a two week holiday from school. I'm sure the time just flew by for the kids but for me it was a very long two weeks. My house was full of not just my own offspring, but neighbour kids and nieces and nephews. Quite a few nights my house was the gathering place for Nora and Sara's girlfriends. The teenage girls spent time gossiping and practicing their dance moves in my living room. One day two nieces that are the same age as Jenna (10) and another that's the year between Sara and Nora came to spend the day and evening. We discovered that they had never been to Tripoli's superstore... The Mahari. 'So let's go!' I said. I got ready and waited while the girls got ready. It took them what seemed like forever to put on their scarves and adjust their clothes... gotta look good if you are going to Tripoli's hot spot... never know who might see you there! We squeezed in the car, six giggling girls and one crazy woman (me). This was going to be interesting. First thing of course is to choose just the right music for the ride. So what shall it be?..hmmm.. oh yes! Kentucky Headhunters... and it's gotta be loud! We got to the store and parked the car. Me walking through the parking lot with six silly girls following. 'Stop giggling!' I told them. 'Mom! We're girls! We're supposed to giggle.' said Nora. We spent a considerable amount of time looking in the housewares department. All kinds of interesting gadgets and shiny things to inspect. We bought a hair dryer and then went on to the supermarket part of the store. Stocking up on junk food to get us through the evening. While in the store we ran into neighbours, one uncle and some of my students; past and present. You always see someone you know in there. We drove up and down Tripoli's most fashionable street. The girls 'oohed' and 'aahed' over all the mannequins in the windows that displayed the latest styles of party clothes and bridal wear. Jenna was flirting with the boys in the next car. She is such a stinker! More giggling. About a half hour later the phone rang. It was niece number one and two's mother calling to say their father was on the way to pick them up. Sigh..the fun was over.. we headed back for home. People have been emailing me, asking me if I'm still around and why I haven't posted anything in a while. Quite honestly it's because I've been busy. It seems the days are never long enough. It's extremely frustrating to me to not to be able to get all the things I want done in a day. Part of the problem is that I have a big family and I expect everyone to pull their own weight. Everyone has a chore to do and when one person lags behind it throws the whole system off. I had a really 'blonde' moment this week too. How I managed it I can't say, but this is what happened: I came home from work and as usual, changed my clothes, had a look around the house and turned on the computer. Everyday after work I fill in my lesson plans, and all the rest of the paperwork and computer work that need to be done. As I was working Yusef came to me and said 'Adam was on your computer while you were at work. He knows your password.' I just looked at him, completely shocked. My computer is off limits to the kids. First, because it's got my work on it and I don't want it messed up. Second, it's because the kids get on the internet and click on anything and everything - downloading junk, spyware and viruses. Another thing they do is mess around with all my settings and that always pisses me off. So my computer is mine - to be messed with by no one. I was angry and immediately changed the password. A nice complex one that contained numbers, suffixes and prefixes. Then what happened? I turned off the computer and blanked out - the password was lost. And I knew it was completely lost. It wasn't something I would remember again, ever. Yes, totally blonde - that's me! I reinstalled Windows. Actually I feel better about it because it hadn't been done in ages and it was time for a fresh start. The only thing that bugged me is that I've been busy and it's just one more thing to add to my already long list of things to do. Now I'm thinking that maybe I should upgrade to the new Vista. Today is the last day of the working week. I've got a full weekend ahead of me. Something planned for both days. I need a vacation. I spoke with one of my old students last week about arranging a trip out to his hometown, Ghadames.... maybe I should take the plunge and make the arrangements for real instead of just always talking about it. A break would do me good. 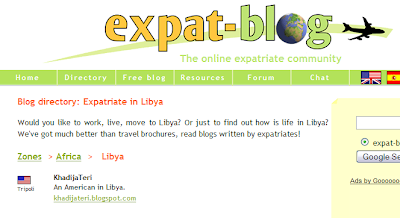 I'm listed on the expat-blog... but I'm all alone. Are there any expats in Libya with blogs? Go add your blog so mine won't look so lonely.